Most of the scenes are rehashed from other trailers, but this clip has a few new moments that I haven't seen in the others. I've snapped shots of these scenes and in one case, I lightened it up so that big 'G' is a little bit easier to see. So yes, as we all know, there will be other monsters. 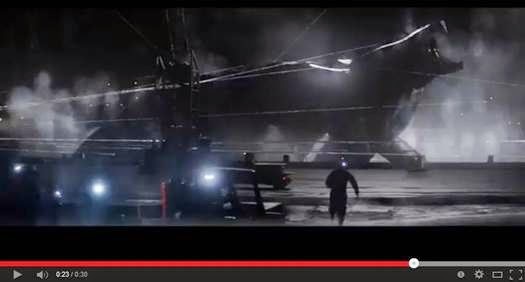 There's this new one (or new look) and in the other trailer, we saw the flying monster hit the deck in the ocean. And I fully expect a decent human story behind the events that involve our big radioactive lizard. Also in the first trailer, we saw a fascinating moment that implies monsters hatching eggs? (Above pic) and what are they holding onto, a missile? 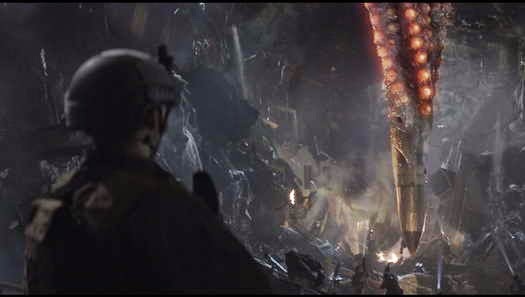 ALSO, keep in mind that Legendary only got the rights to Godzilla himself, so the other monsters in the film are original creations. Though director Edwards said they will be paying homage to the classics. (I bet, if this film does well enough, Toho will probably step up and consider negotiating rights to their other classic monsters. We'll see! I hope we're right. 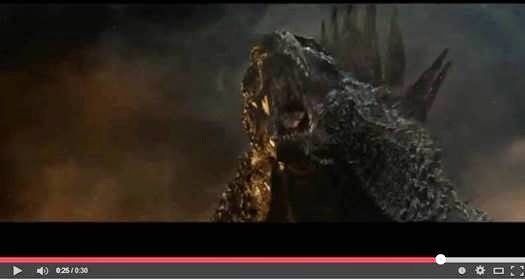 With that in mind, Godzilla opens in movie theaters on May 16th, 2014. And folks, let's not forget, Legendary Pictures was the studio that had the faith in this classic franchise and started this project. Legendary and Warner Bros., since the inception of this project, have split up their exclusive business production relationship. Legendary has since joined forces with Universal Pictures. Have you seen my collective of Godzilla posters?